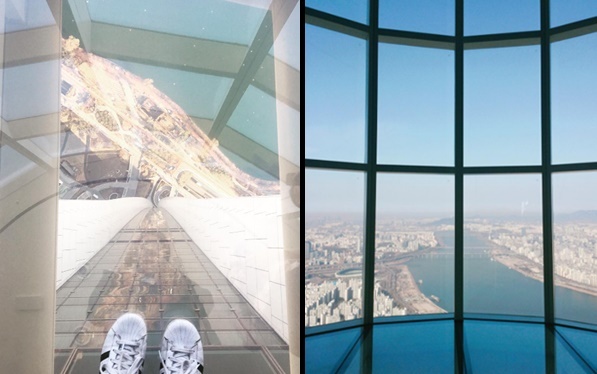 Lotte World announced that it will open Lotte World Tower ‘Seoul Sky’, the world’s third-highest, on the 22nd. Seoul Sky is 500 meters above the ground, and Lotte World Tower consists of 9 floors from 117 to 123 floors. It can accommodate up to 900 people per hour. And if use ‘Sky Shuttle’, a double deck elevator with two cars connected up and down, you will arrive at the observation deck in a minute. Seoul Sky was listed on three Guinness World Records. which goes 600m per min speed from the 2nd basement floor to the 121st floor are the official record. On the 120th floor, there is a sky terrace where you can enjoy outdoor scenery. On the 123rd floor, ‘123 Lounge’, a lounge bar, was prepared. Meanwhile, Seoul Sky maintains a reasonable number of visitors by using ‘The People Count System’, which can identify the number of people and to enhance security, facial recognition systems and airport-level search stations have also been installed.